A/C equipped vehicles require bracket #500-20110 (Large piston type compressor). Does Hedman 68608 fit your vehicle? 68608 is rated 4.0 out of 5 by 3. Rated 5 out of 5 by Hokieman from Great solution for clearance issues My '68 Camaro with dropped front end was dragging the full length Hedman SS headers on every bump and dip in the road. The mid-length Hedman headers and a new exhaust system tucked up nice and neat gave me an additional 4" of clearance. They fit great, and the ceramic coating looks much better than the SS headers they replaced. I like them! Rated 4 out of 5 by Nunzio from A bit of grinding but they are on my 68 Camaro These are for a 68 Camaro with a SB350 and Vortec heads. Passenger side fit perfect, had it in within 10 minutes. The driver side I needed to grind the steering box and dent the center tube, but they now fit. Since I have aftermarket heads the header tips out as stated by Hedman. It is also a pain to get the third spark plug in (45 min.) since the two center tubes cover it up. They work, just get a good gasket. Rated 3 out of 5 by Nicky 39 from One of the headers was all scratched up when i received it. Almost like some one tried installing it and returned it. Was not a simple bolt. Had to cut a bracket for the emergency brake off. 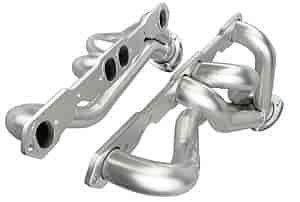 would these headers fit a 1963 c-10 350 conversion?